As you might already know, Xiaomi is working on a successor to the Mi 5, dubbed Mi 5s. We've already told you some of its rumored specifications, and now an alleged render of the device has leaked. The render in question shows the black colored variant of the handset, and the most important thing it reveals is a dual rear camera setup. In case you don't already know, there were reports last month that the Chinese company is purchasing dual-camera modules from Samsung for its upcoming phones. 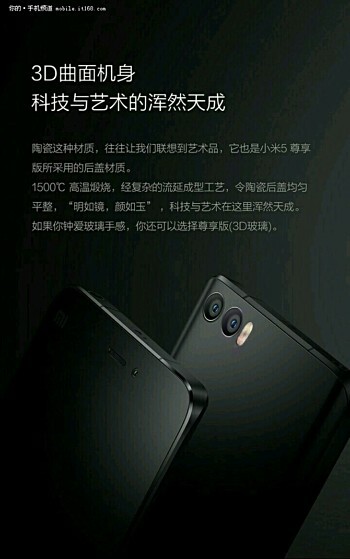 So, the possibility of the Mi 5s sporting a dual camera design cannot be ruled out. As for specs, from what we've heard so far, the phone will be powered by SD820 SoC and sport a 5.5-inch full HD display. It will have 6GB RAM, and feature a fingerprint sensor as well as Force Touch technology. I said foreign not domestic companies, that doesn't exclude other Asian companies as well lol And those two SoC's are laughable compared to SD/Exy's. Kirin is okay I guess but Huawei gotta check their bogus prices. And which western country designs camera sensors? Most phone components are designed and built in Asia but we also have Helio or Mediatek SOCs designed in Asia. China has become a true powerhouse when it comes to smartphones. i hope the camera has some kind of protection like sapphire glass. i cant afford to accidentally scratch the camera anymore.